Stuff it Written on August 31, 2009, by Ingeborg. Lida Baday designed the 15 below zero jacket to help homeless people through the cold. The insulation is provided by yesterday’s information: newspapers. 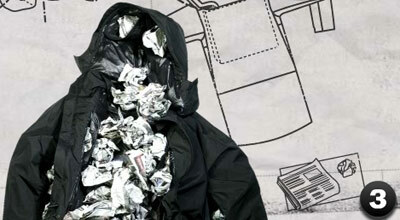 To keep costs low the jacket comes without insulation but with an abundance of pockets to fill up with old papers. A temperature adjustable jacket that can also be worn as a backpack plus doubles as pillow.